Sweet juicy prawns and the delicate tasting meat of the Sockeye Salmon! This salmon and shrimp combination is sure to be a family pleaser. 6 lbs of Sockeye Salmon and 2 lbs of Alaskan spot shrimp tail on 16/20 ct.
SKU: AFS0006. 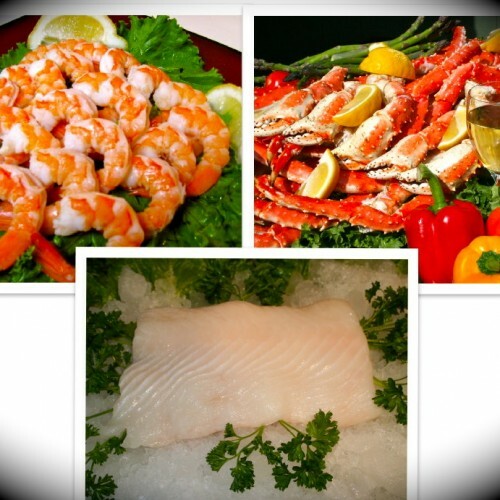 Categories: Alaskan Wild Caught Shrimp, GIFT PACKS, Salmon. Straight from the icy waters of Alaska, this flavorful Spot Shrimp & Salmon Family Gift will please the most discriminate seafood lover. Spot Shrimp and Sockeye Salmon The Sockeye is a firm delicate tasting meat. As you cook, the bright red color will flake and lighten in color creating a beautiful dish for your family or guests. The Spot shrimp are sweet & juicy! Perfect for cocktails . What a great healthy combination of wild caught seafood. Enjoy! We have a regular flow of fresh salmon in all species. Feel free to call our toll free number for more information and see our free fresh catch schedule on the website under fresh!- 855-223-3323.
Who would have guessed that a tiny ten-legged crustacean would arouse the appetite of an entire country? Judging from the enormous amount consumed each year, Spot shrimp has become America's most popular shellfish. Among the hundreds of species that inhabit the world's seas is Alaska Spot shrimp. Dwelling in icy cold Alaskan waters, this miniature shellfish prefers fairly deep water by day and the sea's shallower areas at night. Caught with special nets, the Spot shrimp is then delivered iced to the processing plant then frozen. Its sweet, delicate flavor has maneuvered this versatile crustacean into almost every menu category. Consider Alaska Pink shrimp appetizer quiches or the ever-popular Shrimp Louie. Feature an Alaska Spot shrimp omelet on your brunch menu. Or offer Alaska Pink Shrimp Bisque for lunch. Alaskan Pink shrimp can also be heaped on top of pasta or baked potatoes, tucked into enchiladas and crêpes or added to stuffings and sauces. A little Alaska spot shrimp packs a lot of nutrition. A low-calorie source of high-quality protein, shrimp also supplies calcium, phosphorus, potassium and vitamin A. The State of Alaska recognizes seafood as a precious natural resource and the seafood industry as a vital component of the state's economy. Therefore, Alaska leads the nation in resource management, quality control and conservation to ensure that Alaska Seafood remains the World's finest for future generations.The quality of Alaska Seafood is also determined by what it doesn't contain. Alaska's marine habitats are nearly pollution-free compared to the rest of the world. Feeding on organic marine organisms, Alaska Seafood is additive-free and provides healthful, natural vitamins, minerals, nutrients and heart-healthy polyunsaturated fats.Health Benefits of Alaska SeafoodAlaska Seafood is naturally high in many essential vitamins, including vitamins E, C, D and A. Some varieties are also very high in antioxidant E, which has proven to strengthen the immune system and lower the risk of heart disease by reducing buildup of plaque in coronary arteries.In addition, Alaska Seafood contains a wide variety of minerals, including zinc, iron, calcium and selenium. The high nutritional value along with a lean, firm texture and superior flavor makes Alaska Seafood a great, healthy meal alternative.